Hands-On Training and Job Placement Assistance! Sheet metal workers make, install, and maintain air-conditioning, heating, ventilation, and pollution control duct systems; roofs; siding; rain gutters; downspouts; skylights; restaurant equipment; outdoor signs; and many other products made with metal sheets. They also may work with fiberglass and plastic materials. Although some workers specialize in fabrication, installation or maintenance, most do all three jobs. Hands-On Instruction: Our Lab portion of this program provides hands-on lab and lecture training in the procedures and skills necessary to to work in a growing industry. Sheet Metal Fabrication is a “hands on” profession and there is no better way to learn it than by actually performing it. 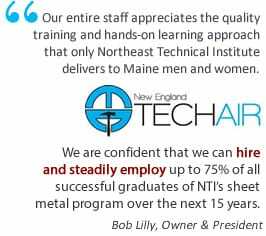 That’s why as a student in the NTI Sheet Metal Fabricator program, you may qualify to take part in a professional externship experience. An externship is a great way to gain real world job experience and get a feel for your new career after you complete the program and meet the school’s graduation criteria. This program is an industry contract training course and is not accredited by our accrediting body (Council on Occupational Education). The program is licensed by the Maine Department of Education. This program is a great way to get into the career that you weren’t sure how to get to from where you were. Very supportive staff and peers to help out with getting to know your stuff in a very constructive manner that will help make it stick when you are put into the field.